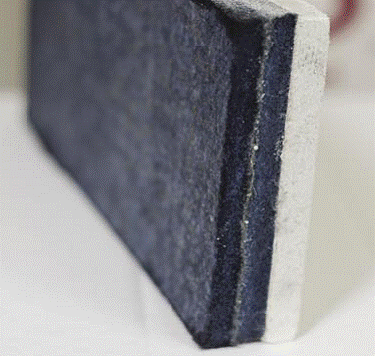 Why PVA on Aerogel Boards? At the end of 2015 I finally tackled the remaining significant area of the house that had not yet had IWI (aerogel Internal Wall Insulation) applied: the two bedrooms (upstairs) on the blank north wall of the house. There is also a tiny bit of the master bedroom east-facing exterior wall to be done this time, along with associated works such as replacing the window architraves/reveals with deeper and condensation-resistanct versions. Also, swinging a radiator away from the external wall to reduce heat losses by reducing heat gradients. In future we may redo the bathroom and toilet, and apply IWI to them then. Ignoring thermal conduction through the studs (treat as void) and the fibre quilt gives ~0.25W/m^2 U-value. Replacing the 100mm studwork with 100mm softwood (0.13W/Km^2) gives ~0.22W/Km^2. So the real U-value probably lies between those values. I'm trying to tackle some of these issues by getting precut, smaller boards, and we're going to attempt to reduce dust with a PVA coating, see below. [The builders] are planning to try putting a thin coat (sprayed?) of PVA on to keep down the dust that they so detest; any harm in them doing that? I have heard of others doing similar and can't see any real issue with a thin coat of PVA spray applied. I know that some coatings can interact with the thermal performance however these interactions are generally minimal and involve more chemically active coatings. Update 2015/10/06: just placed the order for the pre-cut aerogel; expensive but still going to be less than the labour I think when all done. Update 2015/10/26: works started today. It occurred to me over the weekend that we have a potentially unpleasant thermal bridge in the NW corner of the rear bedroom where the existing aerogel on the west wall runs up to the old plasterboard on the north wall. The builders dug out the north-wall plasterboard fragment behind the aerogel and foamed to avoid a bridge sideways (or air leakage) through the old plasterboard. The builders report a happier experience with this smaller pre-cut board though they still had to do some trimming. As with the IWI of the smallest bedroom, the partition wall to the next (in this case, master) bedroom has been cut away allowing the aerogel to run continuously along the outer wall, eliminating thermal bridging from the exterior wall into the partition. Update 2015/11/06: after some delays in plaster drying (from three days of fog dense enough to ground planes at nearby airports) most of the painting was complete by today. Ran a small portable dehumdifier in the room for the last couple of days, long after I assume that the plaster would have 'cured' so the risks of it drying to fast and falling off should have been small. Tasks still to complete include replacement of wooden window reveal with PVC version to resist mould growth better, refitting of radiator and power sockets, and fitting of a door stop. The room should be usable from Tuesday (2015/11/10). Update 2015/11/09: on removal of the reveal we discovered visible gaps between the (3G!) windows an outside wall as we had feared (several mm wide in places); the window fitters failed to foam the gaps for at least a second window! Explains the cold draughts that we thought we felt. Update 2015/11/10: we have the room complete and back in our hands today, hurrah! Update 2015/11/11: early indications (from the first night reoccupied) are that the room has retained its heat well (a shallow downwards slope for temperature), which is good. Update 2015/11/16: some evidence that now with one person in the room (80--100W?) and a temperature differential to outside of ~5°C (18.5 vs 34.5), the room temperature does not drop or even rises slightly. See red (1g) bedroom temperature vs purple (4o) outside overnight in this graph. Expected outside temperatures of ~2°C mid-winter suggest a ~16°C differential which would imply a ~300W heat demand, dropping to ~200W when occupied, though as the heat is off overnight, there will be a temperature drop. Looking at our iMeasure kWh/HDD data back to 2007, and given iMeasure's use of a 15.5°C base temperature, I see that most weeks have had an HDD of 84 (so temperatures at/over 3.5°C) with the worst week (early Janurary 2010) at an HDD 116 implying a mean 24h temperature around -1°C. A mean 24h (ie day and night) temperature of 2°C would imply an HDD ~95, and that is pretty far to the right of the chart; some years have no weeks that cold (eg 2014's maximum HDD week is 70). Update 2015/11/22: down to ~0°C last night, which is almost the worst case for winter, and we see a temperature drop of ~3°C overnight in the occupied (1g) bedroom, which while not "no heating required" is acceptable. Before lights out temperature was over ~18°C on all walls at eye height, internal and external walls, though down to ~14°C on the external wall behind furniture, so that may need an eye kept on it, see graph. Update 2015/11/30: works started in the master bedroom and off to a good start with the old plasterboard off well before lunch and the aerogel going by end of day. Lots of foam used to make air-tight. There were visible gaps round the new 3G windows again. Update 2015/12/02: again it seems that our HDD base temperature really is close to 12°C, eg in this graph, see that the temperature of occupied rooms didn't fall overnight, only the currently-unoccupied study (5s). Update 2015/12/08: plaster only ~50% fully dry and temperature dropping to ~5°C overnight, so closed the windows and put small dehumidifier in room to help get ready for painting. Update 2015/12/10: plastering was on 3rd and 4th, and the the green crosses on the night of the 4th onwards show the relative humidity in the room, from the evening of the 6th with the sensor sitting in the wall in a vacant socket. The plaster nearly dry as the humidity dropping below 80% with the dehumidifier running for the the second 24h (having filled and stopped overnight/morning of the 9th). This graph shows a differential from outside of ~9°C being maintained by the dehumdifier's nominal 183W power, so ~0.05K/W ie 20W to maintain 1°C over external temperature; the 183W is about the heat output of two people, though note that this dehumidifier is a heat-pump with a CoP a little over 1, and also that there are no curtains present yet which may understate final K/W. Update 2015/12/16: ... and we're done! (We actually got the bed back in last night but there were some finishing touches needed such as rehanging the door, the window reveal, and some paint touch-ups. Furniture and other stuff will go back in gradually, but already the decluttering of the rest of the house is noticeable. 2015/12/18: Building control visited to sign off the work. All including VAT at full rate. Relative costs (insulation and labour). Condensation/dewpoint risks, eg in the studs from any vapour leaks. Cutting list to avoid the builders having to destroy so many saw blades, and fitting plans c/o Mansell & Woodland. 2015/10/18: ebuild.co.uk: Drying Out, Condensation And Damp In Winter: it may be tricky letting the plaster dry in cold and damp weather. Relative humidity and mould c/o UCL. Suggests OK to have RH% at 85% for 1 day, 75% for one week, 65% for one month. First published 2015-10-03 , updated 2019-04-22 . Site copyright © 2007-2019 Damon Hart-Davis. Hosted by ExNet.